The transformation is complete! The 1890's origins are left far behind in the just completed remake of this flamboyant period townhouse into a dramatic contemporary 22' wide single family home. 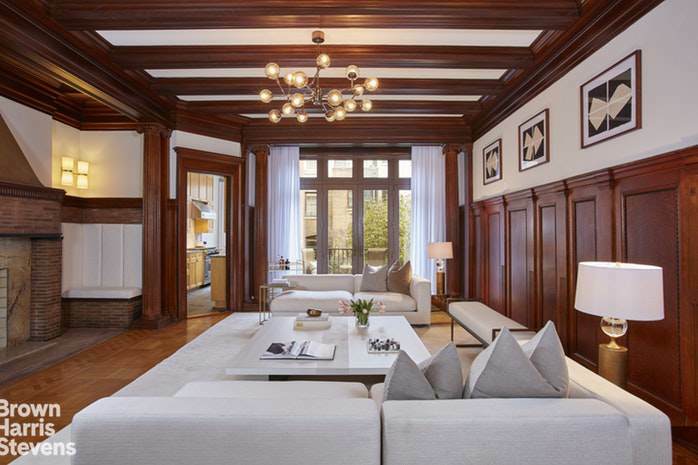 Located just off Riverside Drive on West 76th Street, the almost 8,000 sq. 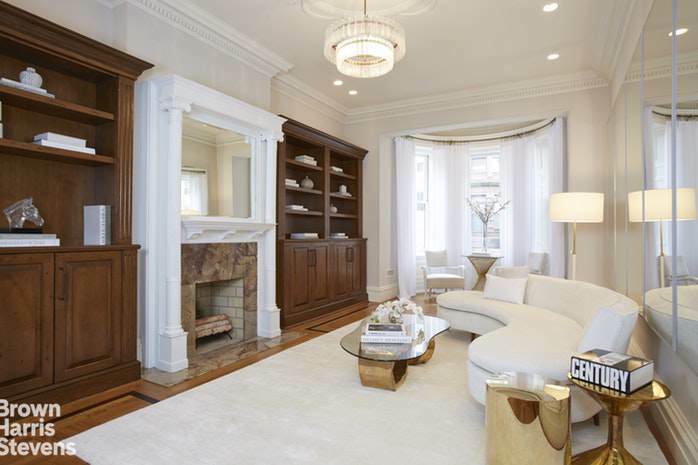 ft. feature 10 mansion size rooms, 5 or 6 bedrooms, two full cooks kitchens, 7 wood-burning fireplaces, a hi-speed Otis elevator that reaches all floors, garden, and 4 terraces with river views. Today's most desired clean finishes and colors are shown to advantage against the rare historic woods and marble slabs. Still present are the timeless flow and dimensions rarely seen, even in houses twice the price. The fabulous natural light and river views alone are worth the visit! Plaster walls, 7 zones of HVAC, central vacuum system, and a breathtaking central atrium staircase distinguish this home. Nearby are Riverside Park, Fairway, Citarella, Zabars and Lincoln Center. 327 WEST 76TH STREET LAYOUT:Garden Floor: Two bedrooms (could be offices/guest bedrooms) and two gorgeous marble lined baths. This floor leads on to the planted garden. First of two laundry rooms is here as well. An under the stoop entrance provides a second private access. Below this floor is a cavernous cellar where the mechanicals and 1,000 sq. ft. of storage are located. 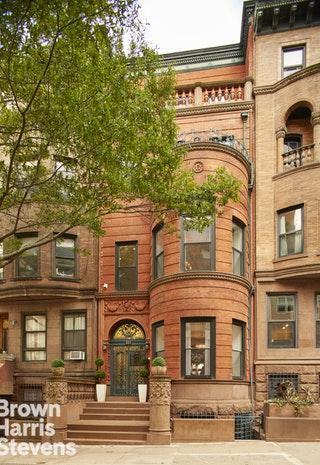 Parlor Floor and Third Floor: Christopher Grey in the New York Times in 2012 called the entrance to 327 West 76th, "fiery" with its bright red brick and imposing iron double doors. 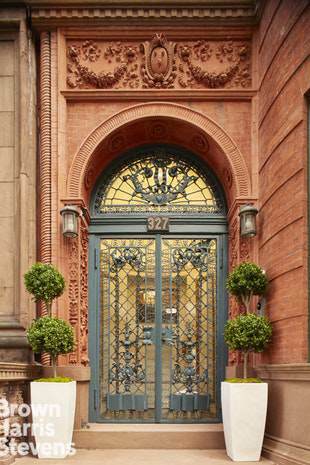 The entrance bespeaks privacy and the detailed vestibule beyond says a perfect restoration has taken place. These two floors are an entertainer's dream with reception room flowing into a baronial great room 21' x 28', a living room 21' x 25' and dining room 15' x 20'. The 650 sq. ft. planted garden becomes part of this entertaining world through double French glass doors off the great room. Two top-of-the-line kitchens feature granite countertops, custom cabinetry, stone floors and 4 windows. The stately dining and living rooms feature 14' ceilings, bay windows and ornately carved cherry mantles surrounding wood-burning fireplaces. The living room has an immense French crystal chandelier, and a south-facing rotunda with 3 windows offering Riverside Park views. Fourth Floor: The master suite includes 20' x 20' bedroom, a private terrace, wood burning fireplace, luxurious master bath with marble surround luxuriating tub and glass enclosed steam shower. A second bedroom 20' x 16' on this floor also with wood burning fireplace, is an office with dramatic Juliet balcony over the house's front turret.Fifth Floor: Two more bedrooms here, 20' x20' and 20' x14', one bath. The front bedroom has a terrace with period terracotta stone balustrade and views to Riverside Park. The second laundry room is on this floor. Penthouse: The palatial central stairs continue to the penthouse level. Here are a grand 20' x 21' terrace and an outdoor hot tub. The spectacular views of the Hudson River are a rare feature for a townhouse.